This website will show you the moon phases for the current calendar month. It’s helpful when you’re trying to plan a landscape shot and need the moon to be in a specific phase (mostly likely full). I usually just use it as a sort of “quick look” planning tool, and then move on to the next site for more details. This is a cool tool developed by the United States Navy that will give you complete sun/moon data for a day (after you give a location). It’ll generate this nice one-page summary that lists sunrise/sunset times, moonrise/moonset times, and civil twilight start and end times. I like to print this page on trips to the desert, so I can also use it to take notes on. 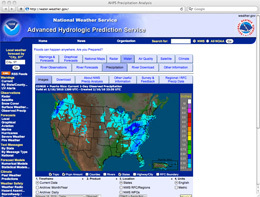 This website is run by the United States National Weather Service, and has a ton of information on precipitation history. I really just use this for finding good wildflower spots in the spring (more rain in an area usually means more wildflowers), but there’s probably a ton of other things you could use this for. Maybe you could use it for scouting waterfalls too, since some of them are primarily fed by snow melt. 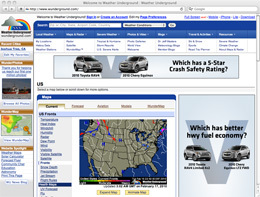 Weather Underground has some of the most detailed weather forecasts available on the Internet. What’s particularly useful about their forecasts is the percent cloud cover throughout the day. Of course, this isn’t usually accurate a week in advance, but I use it often the night before I’m planning a trip outdoors. Knowing when there will be clouds could be helpful for things like waterfalls, wildflowers, and landscapes (i.e. sometimes you really want that clear sky!). This is an awesome tool that Weather Underground just released: it will show you weather conditions overlayed on top of a Google Map (I’ve been waiting forever for this!). You can see cloud cover, temperature, and precipitation. You can also quickly move between cities and different weather stations to get detailed information on things like wind speed, visibility, etc. This tool can be useful for planning trips to see and photograph wildflowers or waterfalls, where you want some cloud cover. You can use it for the opposite too: say you want to go out and see some dragonflies which won’t be around if there’s overcast skies. great post but you forgot the photographer ephemeris by Stephen Trainor. It’s an amazin application for Mac &PC. You choose a spot on google maps and it tell you when sun and moon will rise/set and what would be their trajectory. These are all excellent resources. 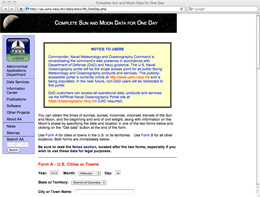 I regularly use the U.S. Navy Sun/Moon data site for both sunrise/sunset times as well as azimuth. Another resource I use frequently is Google Earth. It’s amazing for virtually scouting a location without ever having to leave your office and it seems to get better with every new version. 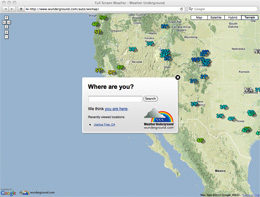 I also use Desert USA (www.desertusa.com) to keep track of desert wildflower blooms in the spring. Finally, and this really is a no-brainer, the National Park Service website (www.nps.gov) has tons of useful information including park maps, flora/fauna, hiking, etc. Really good topic and resources listed here! Although not a web site I find my iPod Touch to be extremely useful to me. I have electronic versions of my 5D, 40D and flash on it. Sunrise/Sunset calendar, Birds of the South to assist with bird identification and once Dual Electronics releases it I’ll have a GPS cradle for my iPod Touch so I can use it for navigation as well. 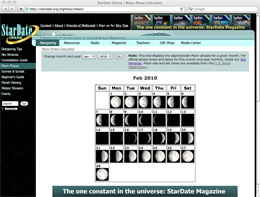 You missed “The Photographer’s Ephemeris” (TPE) by Stephen Trainor which is free for Windows and Mac. @Thomas / George – Good call on the Photographer’s Ephemeris, which I’ve talked about in a previous post. I should have included it here too. I agree, it’s an awesome tool! @Bret – Haha, I also use DesertUSA for wildflower reports in the spring 🙂 I always go nuts refreshing that site over and over every Tuesday (when they usually update it from the weekend). @Zack – Good addition 🙂 you’re making me think I should do a post just on helpful iPhone apps.. I rely on MagicHour a lot for sun/moon times and azimuths. Do one for sure. Let me know when you start working on it and I’ll send you a list of what all I use on my iPod Touch. One more site for sun and moon calculations is http://www.timeanddate.com/worldclock/moonrise.html – after entering your location information and getting “generic” moonrise and moonset information for a time period, you can ask for “all columns” for either the moon or the sun and get a lot more information including things like azimuth, percentage of the moon’s disc that’s illuminated, three different definitions of twilight for the sunrise/sunset (astronomical, nautical, civil), etc. Sometimes the best lighting for nature is at this time of day.